Publicly performing a play is the final project of Harvey Mudd’s annual spring Shakespeare course, one of the College’s most iconic humanities offerings. A major challenge the class faces every year is finding a good location to perform in an effort to bring Shakespeare to as many people as possible. Literature professor Ambereen Dadabhoy dreamed of being able to perform the plays off-campus, making the productions more public and thus accessible to more people. For that to happen though, the class would need some kind of mobile stage to take with them for more public shows. Fortunately, the Shanahan Endowed Student-Directed Projects Fund was an excellent way to make those dreams a reality. After applying for and receiving ample financial support from the fund, we got to work planning and building the new Shakespeare stage cart. Our student team consisted of Zayra, a senior engineering major who had taken the Shakespeare course before, Frank, a sophomore engineering major with a background in woodworking, and Laurel, a sophomore computer science major with a background in theater tech. 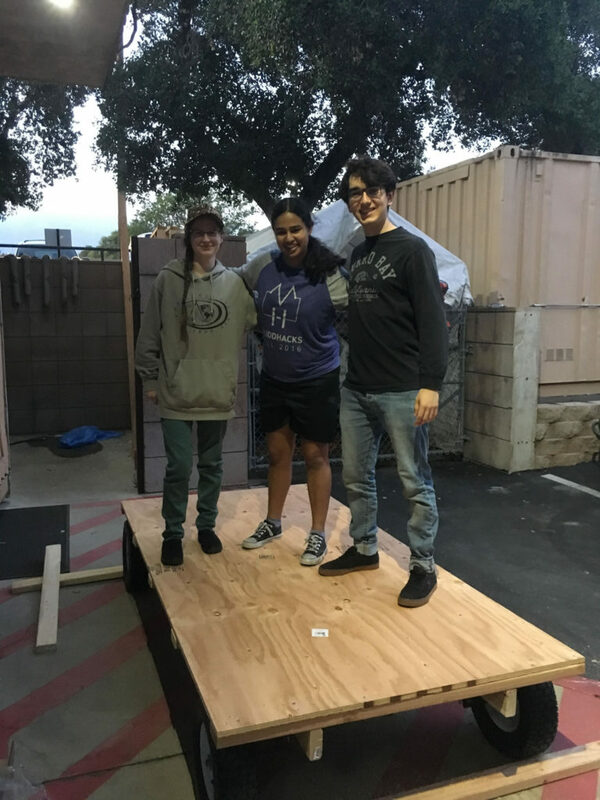 Through our work on this project, we hoped to not only improve our design and construction skills, but also to understand how a stage cart like this might be used to help students bring Shakespeare to life. For example, we learned the cart would likely be used for intimate scenes between two lovers sharing a moment or two spies exchanging secrets, so we based the dimensions of the stage off of these close-quarter scenarios.  This blend of theater, literature and engineering is what made the project perfect for Harvey Mudd students to tackle. The first thing we did was plan. 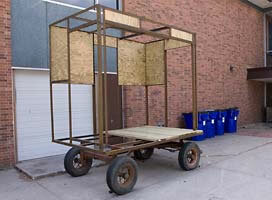 A design that inspired Professor Dadabhoy to pursue this project in the first place was a stage cart built by students at Knox College. This design used a donated “6-by-10-foot base from a grain wagon” as their wheeled base, and had a welded metal frame building up from that. 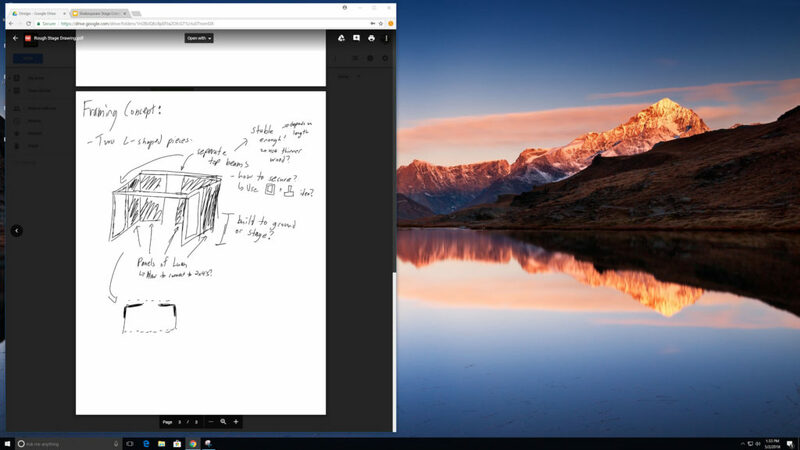 Using this as our initial reference, we then began to think about how we would have to modify this design for our own purposes. We began by considering the necessary dimensions for our cart. To allow two people to comfortably stand and move around on the stage during a performance, we determined that our cart’s frame should be at least 3-feet deep and 6-feet tall. Since the height of the base and frame from the ground would be determined by our choice of wheeled chassis, we left that determination for the material selection step of our process. We then went about selecting our wheeled base. We chose a similarly dimensioned base as the original. We also determined that building up from this base would allow actors to easily step up onto it from the ground due to its 17-inch height. Another difference between the Knox College cart and ours ended up being the frame around the base. Because their cart’s metal frame is attached to the base itself, we planned on doing the same with our design. However, what we forgot to consider in our initial designs was the storage space that the cart would need. We realized that if we had the framing attached to the base, it would not fit through a standard doorway and would take up a lot of storage space. So, we decided to make the framing completely separate from the cart so that they could be laid horizontally on top to fit through doorways and to store. Aside from planning the design of the cart, we also had to figure out where on campus we were going to build it. 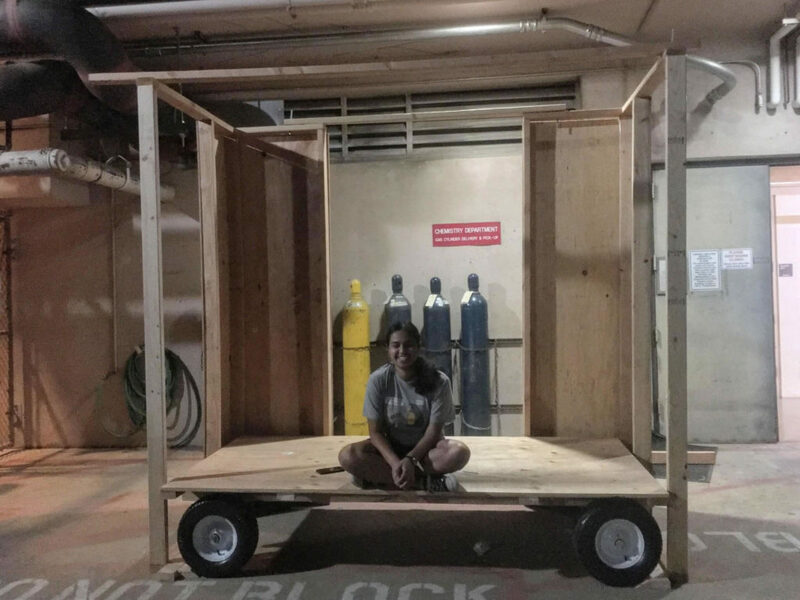 Due to the cart’s large dimensions, we could not store our materials and partially built project in Harvey Mudd’s machine shop or Makerspace. So, we reached out to the Facilities & Maintenance Department for assistance. Senior Director of Facilities Troy Hangsen helped us with materials selection, project logistics and basically any small bump that came up. Senior Director of Operations & Emergency Preparedness and Employee Safety Theresa Lauer helped us immensely in identifying the storage shed and loading dock on the east side of Platt Campus Center for our use. Custodial Services Manager Lino Galaviz also assisted in that process by cleaning up and helping us set up in the loading dock and closet. We were able to order the cart frame online, but we wanted to select the lumber, fasteners and power tools by hand to ensure we were getting the best quality hardware possible. Once we had all our materials back on campus, we started the construction process. 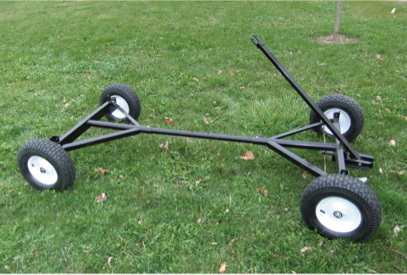 We began by assembling the wheeled base, since it was shipped to us in pieces. Next, we drilled four holes in the base for two 8-foot two-by-fours to span the length of it. Then, we attached several 4-foot two-by-fours perpendicular to the eight footers, spaced out to support the plywood on top of them. With the base complete, we began to construct the 2 x 4 frame of the walls. Once we made sure that framing was flat, we attached the plywood to the frame and set the walls up next to the cart. After measuring the gaps between the wall bases and the cart when they were pushed as close as possible, we made wedges for the wheels to stay in place and cross beams to stabilize the walls. 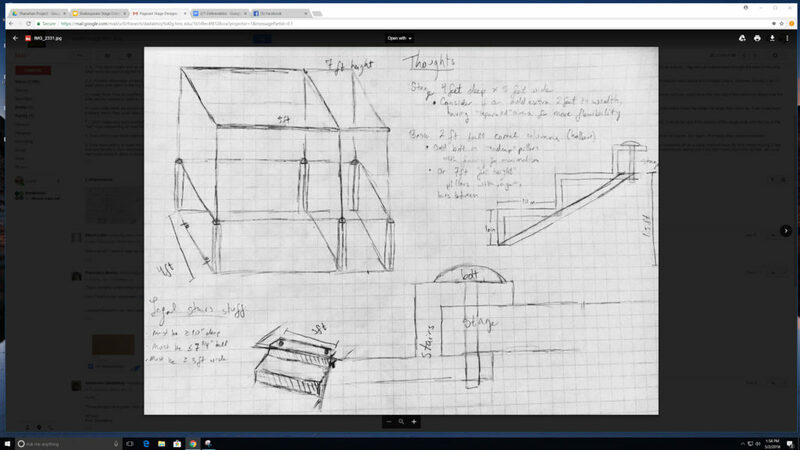 In terms of future work, we think the incorporation of removable stair units to the sides of the stage would greatly improve safety for the actors climbing up and down. Additionally, the aesthetics of the cart could be easily enhanced with some painting and sanding of the wood. Still, we are pleased with the final product and learned plenty from this project about woodworking, design, project management and the intersection of STEM and humanities. For example, we directly witnessed how important ergonomics are for a design, especially for unwieldy components like our stage walls. We also learned to consider storage space for a project while it’s being worked on and after it’s complete rather than taking the availability of large work and storage spaces for granted. Finally, we realized how important having a grasp of both the technical and non-technical parts of a project are in order to fully understand the impact of the work. 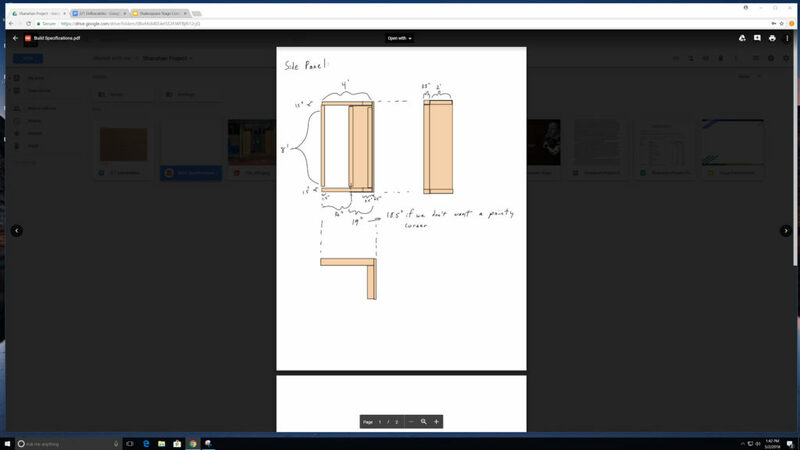 Specifically, we used our understanding of how Shakespearean plays might be portrayed onstage to inform the design and construction of our stage cart. This technical and contextual understanding of our work allowed us to construct a stage that will satisfy the theatrical demands of the Harvey Mudd Shakespeare course. 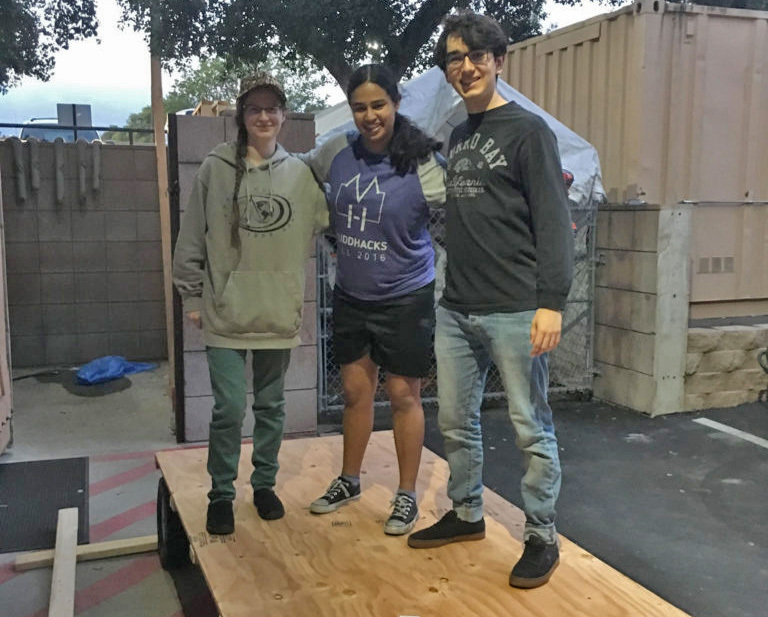 So, having learned these lessons and gained a greater appreciation for design, construction and theater, we hope the stage cart fulfills Professor Dadabhoy’s dream of helping the Harvey Mudd Shakespeare class make all the world a stage!